Innovative Technology’s exceptional portable power units are among the best MyMac has evaluated. When you consider their design, engineering, and price, each of these three products receives our recommendation. 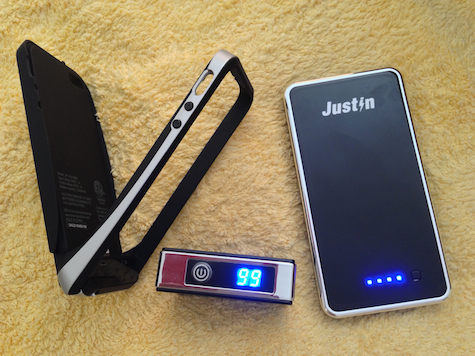 5,200mAh Power Bank with LCD Display is my favorite. It is small, stylish, efficient, and it has the best battery percentage LCD display in the world. This little silver and black gem fits easily into a hand or pocket. 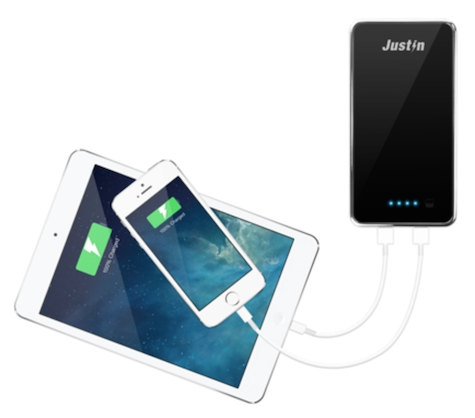 It has enough reserve power to charge an iPhone twice from dead to full, or an iPad from empty to halfway full of juice. Observe the bright blue LCD slowly count down as your iOS or other 5V/1A USB-charged device’s battery indicator fills. Then watch the LCD count up as you recharge the Power Bank from an AC wall power charger or another 5V/1A source. Every Justin power product includes a full written manual in English. Instructions are comprehensive and are easy to understand. Extra points go to Innovative Technology for their full-service printed User Manuals. All necessary cables are included in every package. 10,000mAh Power Bank is a workhorse of a portable powerhouse, with two output ports. One is high capacity 2.1A, to match an iPad’s charging specifications. The other is 1A, as in the LCD unit above. Both USB ports can be used simultaneously when charging two devices at once. I call this larger Power Bank “Black Beauty,” because it is! An attractive silver band surrounds the front of the unit that is otherwise all black. Four blue lights indicate how much power is available, or how much charging is complete. 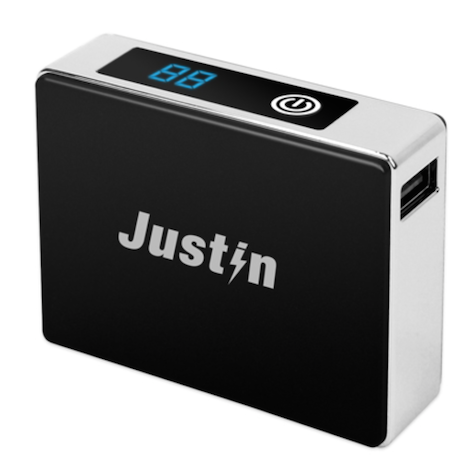 This Justin’s size is slightly larger than an iPhone: too large for a pocket but perfect for a gadget bag or tote carrier compartment. There are no sharp edges on this elegant Power Bank, and it feels sleek in the hand. 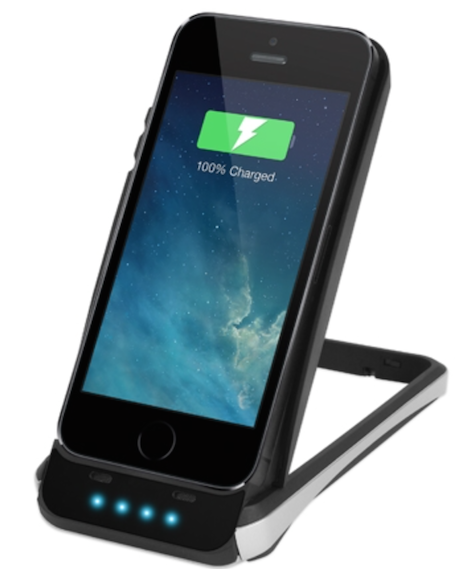 3,000mAh iPhone Power Case protects the rear and sides of an iPhone 5/5s. All ports and buttons are replicated on the case, and a hole opening allows for unobstructed iPhone photography. Speaker volume is good. Once an iPhone is inserted into the Power Case, charging is done with a convenient micro-USB cable, not a Lightning cable. This case doubles as a vertical iPhone stand, as in the photo above. Charging both the case and the inserted iPhone is easy and efficient. The combined weight and bulk are acceptable for pocket use on a daily basis. There is no front glass protection, and no clear touch screen plastic sheet is included. MyMac urges users of this and all exposed-glass cases to buy and use the best possible capacitive screen protector. In spite of its versatility and ease of use, I am not a fan of this product. While in my pocket, my iPhone managed to wake itself up and try to create email messages too often. If you are accustomed to having your iPhone do strange operations and make phantom phone calls, my gripes won’t concern you. The convenience of five-sided protection and extended battery capacity are this Power Case’s major attributes. Justin equipment is available in USA and Canada from select retailers. The list is growing every month. Here is the buying information that was current as of June, 2014.